Grasshopper’s Travis Strikes Again: No More Heroes will be getting a collector’s edition courtesy of Pix’n Love Publishing. Pre-orders have opened up exclusively on the Pix’n Love Publishing website. The Collector’s Edition comes with a physical copy of the game, a hardcover book covering the history of No More Heroes and four lithographs. 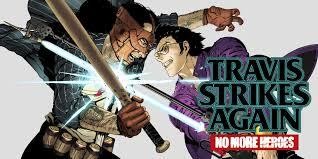 The Price of the Travis Strikes Again: No More Heroes Collector’s Edition is set at €69.90, approximately $80 US. Grasshopper Manufacture and Pix’n Love are thrilled to be the exclusive presenters of Travis Strikes Again: No More Heroes for Nintendo Switch™ in a Limited Collector’s Edition. An “artbook” will bring you back to the loony and colorful universe of the No More Heroesfranchise: artwork, wallpaper, and design documents highlight the incredible art direction of this internationally renowned saga!